Follow-me call forwarding helps your calls find you when you are away from your workstation. You can specify the sequence and up to four numbers that PureCloud rings until either you answer or the call goes to voicemail. You can also specify whether to leave voicemail at your phone or at the last external number PureCloud rings. With the web, desktop, and mobile PureCloud apps, follow-me call forwarding is easy to configure as needed. Warning: Forwarding a phone call to a private phone number could violate certain regulations, such as HIPAA. Do not forward phone calls to private phone numbers if calls could include sensitive information, such as credit card information. Select Phone Details. The Phone Details panel opens. Enter the numbers you want to forward your calls to. The Calls icon changes to indicate that you are forwarding your calls. Optionally, to enable PureCloud to leave voicemail at the last number tried, select the Use the voicemail service of this external number check box. This number cannot be an internal PureCloud number. When disabled, PureCloud leaves voicemail in your PureCloud voicemail inbox. To select User Settings, click your picture in the sidebar. Select Forward My Calls. The Forward Calls panel opens. 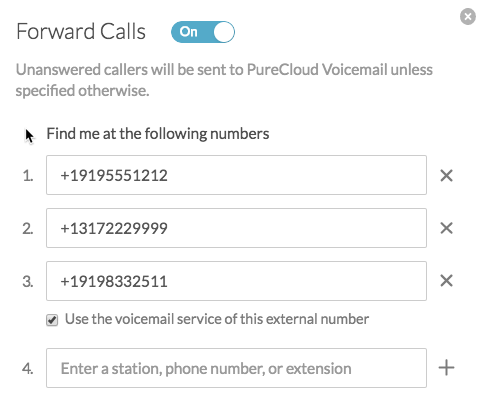 Optionally, to enable PureCloud to leave voicemail at the last number tried, select the Use the voicemail service of this external number check box. When disabled, PureCloud leaves voicemail in your PureCloud voicemail inbox. Caution: Do not use a hardware phone’s menuing system to configure it to wait longer than 12 seconds (two rings) to forward a call. 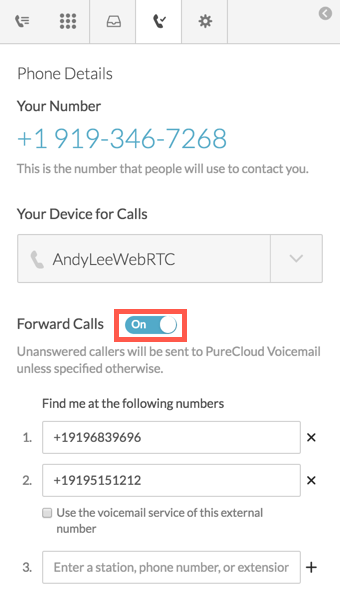 After 12 seconds, PureCloud Voicemail may prevent call forwarding. You must enter phone numbers in E.164 format. You cannot specify an internal PureCloud number for use with the Use the voicemail service of this external number check box. If you are an agent, you cannot forward calls while you are On Queue. Going On Queue automatically stops call forwarding. When you go Off Queue, call forwarding remains stopped. For more information about going On Queue, see On Queue and Off Queue. While you can forward calls to as many as three numbers, be mindful that some callers may hang up before reaching you. If you forward your calls while part of a group ring, the group ring skips you.